Battle of Kadesh (ca. 1274 B.C.) - The Battle of Kadesh was a battle between the two most powerful empires in the world at the time, Egypt and the Hittites. Each wanted the land where it was fought as a buffer against the other. 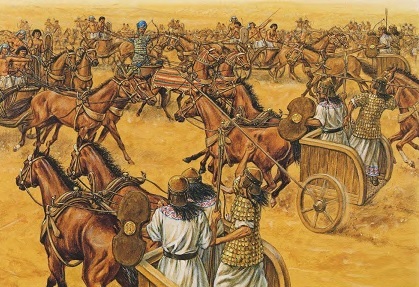 It is considered the largest chariot battle in history with some 6,000 carriages between the two sides. Records show that the Hittites were on the verge of victory when the Egyptians received some badly needed reinforcements just in the nick of time. The fight ultimately ended in a draw, but Ramses, who was pharaoh, counted it as a victory.